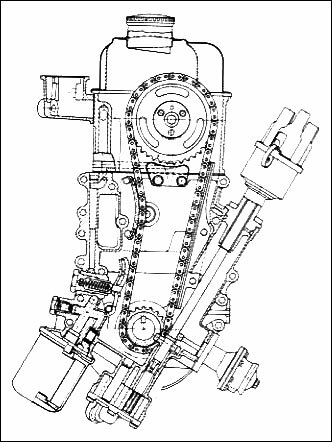 Regarding the CIH Opel engine, the valvetrain does not look greatly different than one side of a Ferrari Colombo, or a Bavaria or Toyota Crown six, or some Isuzu and Mitsubishi engines. The lack of laterally disposed valves for a hemi chamber and crossflow porting does seem an unnecessary compromise from those designs which mostly existed at the time this was launched. 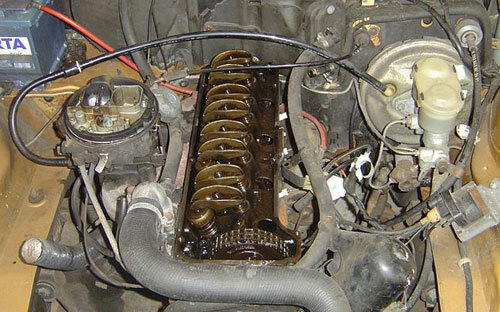 Putting an overhead cam on the Chevy inline six to achieve the Pontiac OHC six was a similar exercise to this CIH, and was done in 1966. The servicing disadvantages of having to retime the cam when removing a head for a valve grind would seem to outweigh any real point in doing so, since the combustion chambers were not improved, nor the non crossflow porting on that Pontiac. Indeed, some of its ports were siamesed, in comparison to the full twelve ports found on the OHV Chevy it was based on. Actually, since it was a deep skirted block it was not truly a derivation of the Chevy at all. Great article. I’ve traveled many miles behind Opel CIH engines. 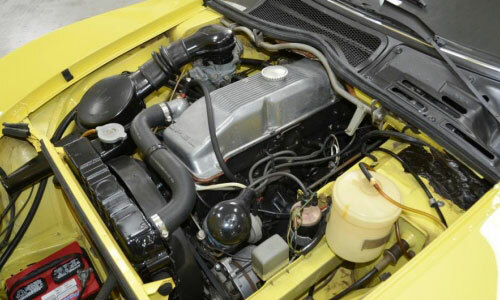 Designed in the early 1960’s, Opel CIH 4 & 6 cylinder engines were produced from 1965-1995. A stepping stone for sure, but a 30-year life span indicates the basic design was a worthy effort. Many car builders (Opel included; see 1.0, 1.1, 1.2 liter OHV engines) soldiered on with cam-in-block / push-rod engines for all of the years the CIH was produced. These engines are reliable, easy to maintain and repair, easy to modify and spare parts are readily available. Regarding efficiency, I get 38 mpg out of a stock 1.9 liter CIH w/ 5-speed overdrive at highway speeds. All in all, a great little compromise of an engine. Thanks for commenting! I’m jealous you’ve had so much experience with them. What Opel(s) have you owned with the engine? Rather than create a long list, I’ll just say I’ve been fortunate to have owned every model of Opel imported to the US from 1967-1975. My ’67 Kadett Coupe has a 1.1 liter OHV engine of course. CIH engines in everything else. My first car in 1980 was a ’68 Kadett 1500 Caravan, my second a ’70 GT 1900 which I’ve been driving for 30 years. Picked up two more GTs, and some Mantas and Asconas have come and gone. My current daily driver is a ’69 Kadett Rallye; I drove it to work today. So, I’ve never been without a CIH Opel since I’ve been old enough to drive. Rebuilt my first one when I was 17. You’ve been very fortunate indeed. When I finally score my Manta, I think you’ll be my CIH guru. Sound good? Also, is the straight-6 CIH engine anything to write home about re:power or refinement? I have an affinity for that engine configuration. A guru I am not, but I highly recommend the opelgt.com forum as a wealth of CIH Opel information. The straight-6 CIH was only imported to the US in the eighties in a handful of Bitter SC Coupes, so I’ve never had a chance to try one. An article in Hemmings more or less confirms what I had suspected (note that they mistakenly stated it was a pushrod engine); performance depended on the level of tuning. The stock CIH sixes were likely smooth, dependable, but closer to a Chevy Stovebolt-6 than to a BMW-6 in performance. The last versions received various overhead cam treatments; those were likely more comparable to BMW of that era. I haven’t yet posted, but I’ve been a member of that forum for 10 years now; I signed up way back when I got an offer to trade my then-daily driver Audi 4000 for a ’75 Manta. In retrospect, I kinda wish I had done it. Oh well. Very interesting about the CIH 6. And I will definitely have to write an article on the Bitter SC. Definite Ferrari 400/412 overtones, which to my eye is a very attractive car. The cih has always been a firm favourite for me. I have also travelled many miles with one over the years.. my current one is a 2.0e in my manta gt/e ,which I am using everyday through the summer months. my first was 1991 in my even then very old 1976 Vauxhall cavalier in 1.6 model. I then had another one this time a 2.0s again in another Vauxhall cavalier . also another 1.6 in an opel ascona…. that was it for a while until approx. 1999 when I fitted one in my old manta 1.8.. I loved the cih that much I converted from a 1.8 ohc to a 2.oe cih… current one has just done 92,000 miles and apart from a little valve stem oil seal wear or harness of seals and an hydraulic tappet rattle now and again (nothing to serious) still has plenty of life left. although I feel the poor old thing revs a bit high being coupled to a 3 speed gm autobox.. but for 28 years and no re build is doing ok.. Thanks for commenting, Paul. Glad you love the CIH; I hope I have the good fortune to drive one someday. Do you have pics of your Manta stashed somewhere on the internet? Would love to admire it. Given what other GM divisions were doing at the time in terms of engine projects including Vauxhall and Holden, did Opel ever look at developing their own V8 from either the CiH, an all-new design or share the Vauxhall V8 in the same way Vauxhall basically used the Opel OHV engine in the Viva? Know the Chevrolet Small Block V8 was used in the KAD A and B, yet given Opel’s pretensions as a more upmarket marque comparable to Mercedes-Benz it is strange they never considered developing their own V8 engine.